Much of the remediation at RMA is clean-up and on-site disposal of hazardous waste. In the U.S. there are strict requirements for how that waste is disposed and covered. 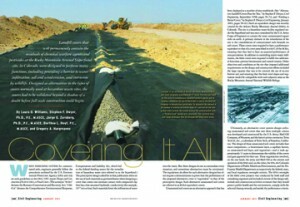 Methods that use synthetic covers have been the accepted standard, but at RMA an innovative alternative cover system was developed by the Army, with detailed involvement by EPA including engineering support and technical analysis from PWT and geotechnical/civil engineering expertise from PWT partners Steve Dwyer and Jorge Zornberg under the leadership of Dorthea Hoyt. This innovative solution underwent eight years of design, testing, and negotiations with regulatory agencies, and construction of 453 acres of the “RCRA-equivalent Covers” was completed between 2005 and 2010. The professional publication, Civil Engineering, published this paper in January 2011. See the published paper.